Mumbai: The National Stock Exchange of India or NSE will arrange a specific trading session for ‘Muhurat trading 2014’ on the event of Deepavali or Diwali on Thursday, October 23, 2014. The trading activity would take place in between 6:15 p.m. and 7:30 p.m. on the Deepavali night, NSE said in a press report. “… hereby notify the specific trading session of Muhurat Trading 2014 on the event of Diwali on Thursday, October 23, 2014,” the exchange notified. Yesterday all our TTTB Trading System users have gone long heavily in a scrip named SARDAEN. This scrip has broken PEAK at 173.90 with a very low KRA value. And from 173.90, BANG, now its trading at 190.90, 10% UP, upper circuit freezed. 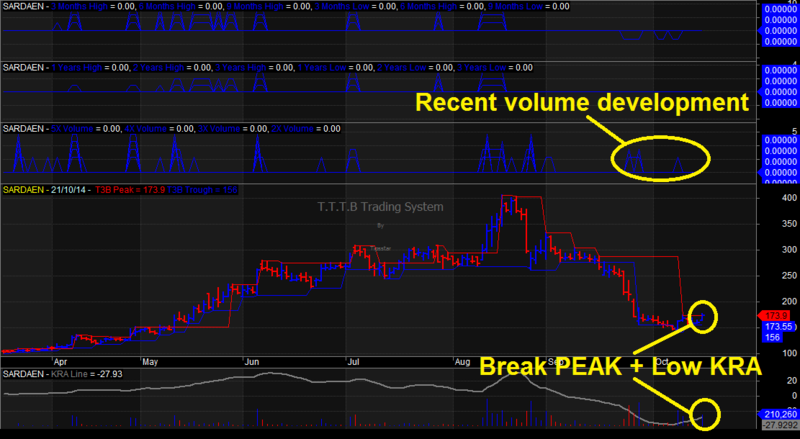 Read more on TTTB Trading System here. Diwali Discount Offer: Grab Trend Blaster Trading System + TTTB Trading System combo pack at 40% straight discount. Hurry, offer valid till 27th October 2014. Some stocks to keep an eye: JSWSTEEL (Peak broken at 1164), SBBJ (Peak broken at 570) and SIEMENS (Peak broken at 829.95). TTTB Trading System predicts rocket upmove in these stocks anytime but exact entry levels are only available to TTTB Trading System users. You will invest ten thousands or ten lakhs that will depend on your risk appetite.